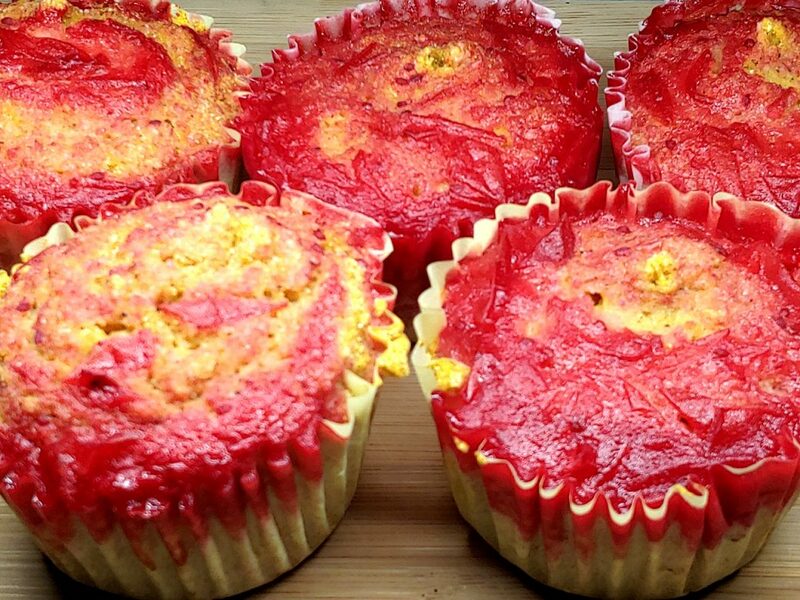 These muffins are healthy and super delicious. Made with pumpkin, cornmeal, rolled oats, flax, cinnamon, and nutmeg with a yummy cranberry compote. This recipe will make about 10 muffins. I prefer to use muffin tins with cupcake cups. Bring to a boil, then reduce to medium-high for about 10 minutes. Whisk in the 2 tsp of cornstarch then turn off the heat and set aside. The sauce will thicken. Flax egg (2 Tbsp ground flax + 3 Tbsp water). Mix in a small cup and set aside while we prepare the rest of the ingredients. Combine all the ingredients in a food processor or blender including the flax egg mixture. Blend until smooth. Fill the muffin cups about ¾ to allow them to rise a bit. Pour 1-2 Tbsp spoons of the cranberry compote on top and using the back of a spoon, straw or chopstick swirl the cranberry through the batter in each cup. You will have about 1 cup of cranberry left over. I like to cover the tops of each muffin with this after they are done baking. Bake at 350 degrees Fahrenheit for 25-30 minutes.